All of our mamas deserve a bit of indulgence this weekend, regardless of eating restrictions. These cupcakes are free of all dairy (yes, including butter), and yet they still manage to be irresistably delicious. Now that is some serious kitchen magic. I swapped my pound of butter for a jar of coconut oil, and, much to my surprise, there wasn't a flying pig to be seen. That versatile, fragrant oil that hipsters love so much makes a pretty darn good cupcake. I especially loved the fact that I could enjoy a prominent dose of coconut flavor in these cakes without chomping down on waxy bits of coconut. I am still hung up on that texture. Aside from the coconut oil and coconut milk, this cupcake recipe is pretty standard, which, as someone who does not typically delve into "free" bakes, I greatly appreciate. Seriously, if a recipe says I have to buy arrowroot, I'm peacing out. The coconut buttercream, on the other hand, requires a bit more love to capture the airy, buttery texture we love so much. Nothing too weird or specialized, just a well-balanced trio of coconut oil, milk, and cream. After these cupcakes have been baked and frosted, you are probably going to need to test one or three before passing them on to your mama. Oh, and since these are dairy-free, that pretty much qualifies them as a health food, right? Preheat oven to 350 degrees and line two muffin tins with 16 cupcake liners. Combine sugar and coconut oil in the work bowl of your stand mixer fitted with the paddle attachment. Cream on medium speed, scraping down the sides as necessary. Beat in eggs, one at a time, until the mixture is smooth. In a liquid measuring cup, combine coconut milk and vanilla extract. In a medium mixing bowl, sift together cake flour and baking powder. With the mixer on low speed, slowly add coconut milk and flour mixtures, alternating between the two, until all the ingredients are incorporated and the batter is smooth. 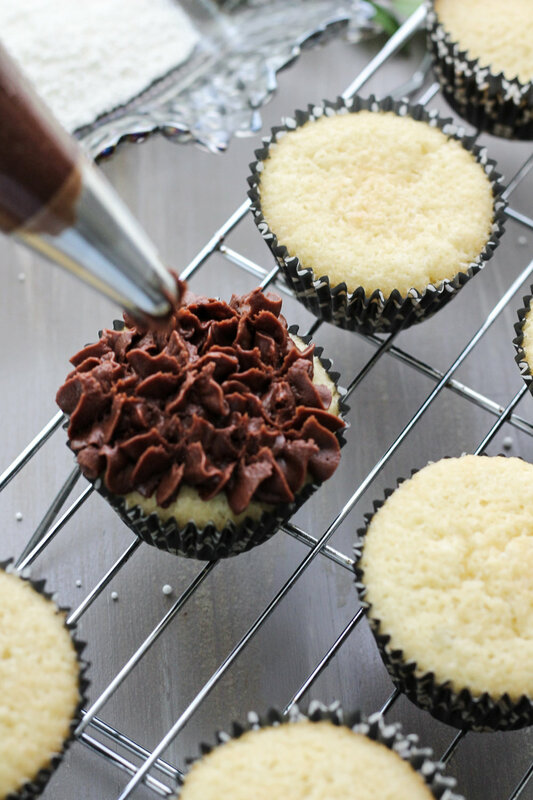 Use a large spring-loaded scoop to divide the batter amongst the cupcake liners. Bake for 18-20 minutes, until the cupcakes are golden and spring back lightly when tapped. Allow the cupcakes to cool completely while you prepare the buttercream. Combine coconut oil, cream, and cocoa powder in the work bowl of your stand mixer fitted with the whisk attachment. Beat, on medium-low speed, until smooth. Reduce speed, and beat in confectioner's sugar and coconut milk. Increase speed and whip for 1-2 minutes, until the buttercream is smooth and fluffy. Transfer the buttercream to a piping bag fitted with a star tip or spread over the cooled cupcakes with a butter knife. Enjoy immediately, or refrigerate for up to three days.